This email that I received from AcresUSA is so good that I am posting the bulk of here, hoping you will visit their site and subscribe. This is the most succinct and cogent explanation of how to farm your soil in a sustainable manner that I have heard in years. Mineralized soil has a specific outcome — to produce nu­trient-dense food and animal feed well-endowed with trace elements. To achieve this requires a properly func­tioning soil. Mineralized soil has four basic keys that need to be addressed: soil energy, foundational minerals, humus and biology, and trace elements. Soil energy refers to a soil’s ability to grow a crop and bring it to maturity. It also takes energy to digest limestone and other rock powders. Soil energy comes from the synchronization that occurs when various fertilizers come in contact with soil and/or other fertiliz­ers. Soil energy is greatly im­pacted by the amount and type of nitrogen in the soil. All soluble fertil­izers will impact soil energy as will so­dium, chloride and other soluble trace minerals. To create min­eralized soil requires a proper amount of foundational minerals that must be digested by soil biology and soil energy. For all its problems, convention­al agriculture does understand that it takes energy to grow a crop. For the most part conventional agriculture completely misses the importance of the other basic keys and consequently does not grow quality food or animal feed, and many organic farmers suffer terribly in yield because their soil has inadequate energy. When plants are grown in low-energy soil they are not healthy. Rather they are low-Brix and susceptible to every pass­ing insect and disease threat. Typical products used to create soil energy are calcium nitrate, potassium nitrate, urea, ammonium sulfate, potas­sium sulfate, MAP, super phosphate, liquid fertilizers and sea solids. For organics, nothing beats high-nitrogen fish and Chilean nitrate. Manures and compost will supply some soil energy as well. Foundational minerals build the optimum environment soil biology needs to flourish and act as the “pre-natal” nutrition needed by soil biology. Foundational minerals refer primar­ily to adequate available calcium and phosphorus. While both calcium and phosphorus can be obtained in the form of commercial fertilizers, these fertilizers do not build a proper foun­dation to construct mineralized soil. If the levels are insufficient, they must be supplied in the form of insoluble rock powders requiring both soil energy and soil biology to break down into an available form. Spe­cific soil amendments used to build foundational minerals include lime­stone, soft rock phosphate and gyp­sum. Due to their strong focus on humus, or­ganic matter and biology, most organic farmers are short of calcium and often short of phosphorus. Available calcium plays a critical role in determining yield and in the health and quantity of plant roots. Humus and biology refers to the living, breathing aspect of soil. As soil biology proliferates, they leave behind organic residues or metabolites. These residues increase the humus content of soil. As they decompose, these or­ganic compounds give off carbon di­oxide that plants use to produce carbohydrates, and the cycle starts all over. 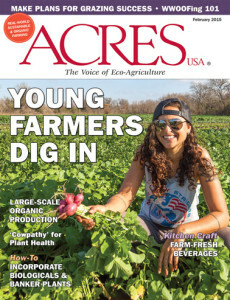 While conventional agriculture has all but ignored this most impor­tant aspect of mineralized soil, many organic farmers have hailed it as the ultimate panacea with nothing else needed. Both of these approaches are incomplete. Products used to increase humus in soil include: cover crops, green ma­nures, compost, fresh or aged manures, dry humates and many more. Products used to stimulate soil biology include: microbial inoculants, liquid humates, compost tea, molasses, sugar, biostimu­lants, enzymes and many other propri­etary products. The final aspect of mineralized soil is the addition of a plentiful supply of trace elements. These include the more commonly recognized elements including boron, copper, iron, manganese and zinc, and the rarer elements such as chromium, molybdenum, nickel, iodine, vanadium, lithium, selenium, cobalt and others. Products used to supply these minerals include the sulfates and chelates of the more com­mon elements, seaweed, sea minerals and various rock powders for broad-spectrum trace elements. Trace elements bound up in rock powders require soil energy and microbial digestion to release them. They also require a plant to have a good level of calcium in order to pull up the heavy trace minerals. Low-Brix plants (i.e. low-calcium plants) are notoriously low in trace elements whereas high-Brix plants provide an abundance of trace elements. The optimum food supply for people and animals should be grown on mineralized soil. By giving soil proper stewardship and learning from the wisdom of generations past we hold within our hands the power to help the generations yet to come as well as our own.